God dwells in my heart. Where is God? If there are no Divine feelings than this heart is not a heart, it is just a rock, a stone. Heart is the one which is full of compassion. Without compassion, the heart is only a stone. Therefore, we need to develop compassion. That is the principle of Love gifted by Jesus. Love...Love..Love..
All are my brothers. Have that feeling. Do not entertain difference that someone is your brother and someone else is your brother-in-law. These differences relate to the body alone. For the Atma, all are our brothers. The living entities in this conditioned world are My eternal, fragmental parts. The Lord said, “All are My sparks only”. Youth – Men and Women, you have to travel long in your life. In such a journey, less luggage more comfort, makes travel a pleasure. Our desires are our luggage. We need to reduce our desires gradually. How long do these desires last? What is the benefit we get on account of these desires? No desires accrue to us. Love is the very life for human beings. 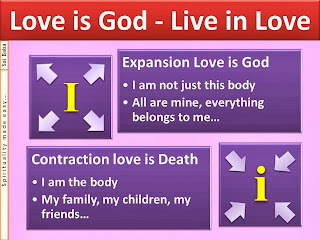 Love is God, live in Love. However, we are losing that very Love today. Even the love that we have has become distorted today. 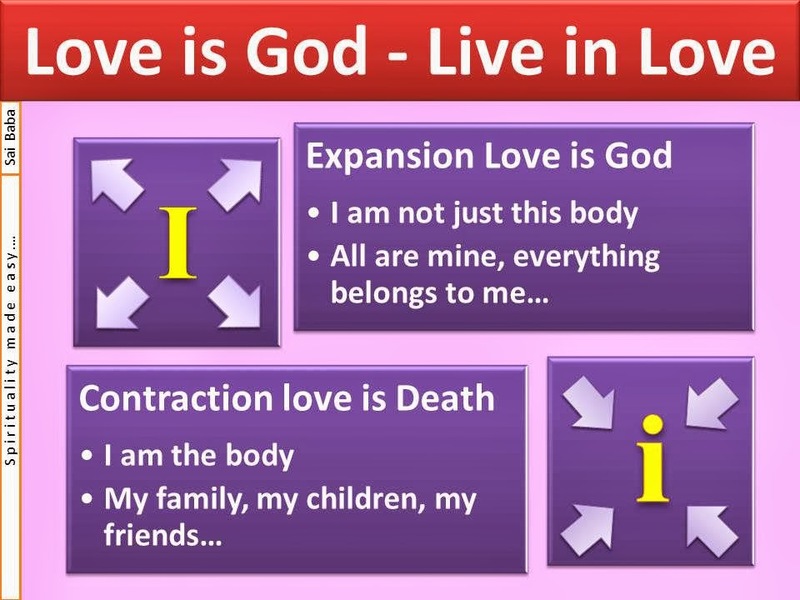 But the Divine Love is heart to heart, Love to Love; not body to body. 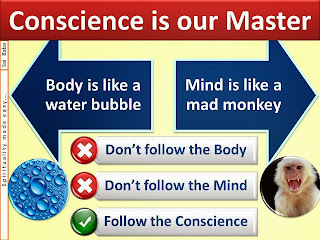 Body is like a water bubble, mind is like a mad monkey; don’t follow the mind, don’t follow the body; follow the conscience. 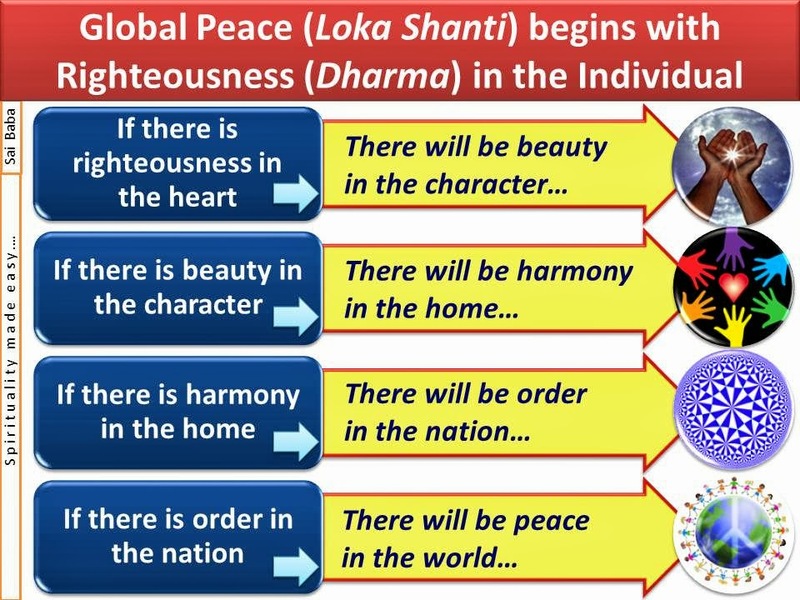 Therefore, in order to get peace, we must develop right character. 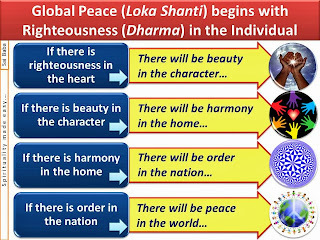 Right action is referred to as Dharma. In order to have right actions, we must first have right thoughts. First of all, we must develop peace in our homes. But even before developing peace in our homes, we must nurture peace in our hearts. If you yourself do not have peace, how can you confer peace on your people at home? And if there is no peace at home, how can you confer peace on the people in your town/city? We must ensure that our thoughts are set on the right path. As soon as the thought emerges, we must enquire whether it is good or bad. But human beings, being in a hurry, do not give any opportunity for such an enquiry. 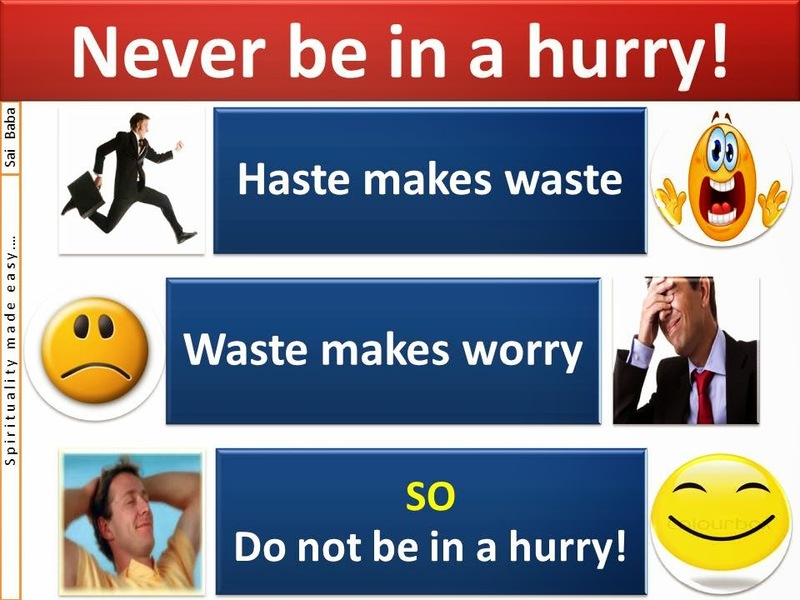 Humans are always in haste. They want everything as soon as they desire. Therefore, in such situations, we must go slow and offer our thoughts to the intellect. Based on the enquiry conducted by the intellect, we must take the final decision. Then alone can we enjoy peace. Therefore, we must develop and nurture faith in ourselves. Love manifests only through faith. Only through love, we can get peace. 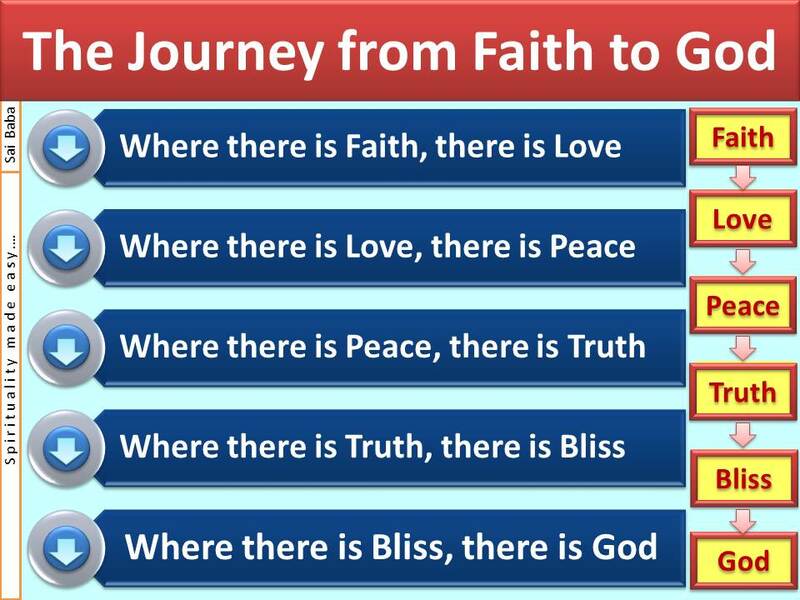 With peace, we will be able to enter onto the path of truth. 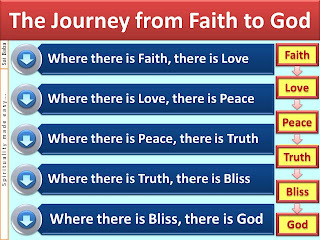 Walking on the path of truth, we can get bliss. Finally, the bliss gets transformed into the form of God. Without faith, we will become blind. We develop faith in all sorts of silly things, but we need to have earned some merit and be deserving to develop faith in truth and in sacredness. Sairam. Some of the pictures used in the illustrations are not reverential enough to depict Bhagawan's sayings: like the one in "Less luggage more comfort..." He liked human beings dressed properly, fully covered, and set an example Himself.